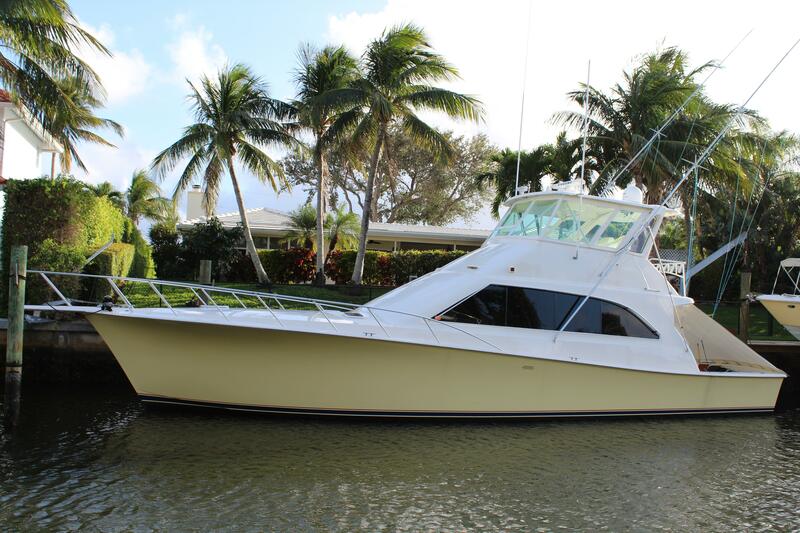 The 53 Ocean is a very well designed, roomy boat for the owners and his guest to cruise in style and comfort. 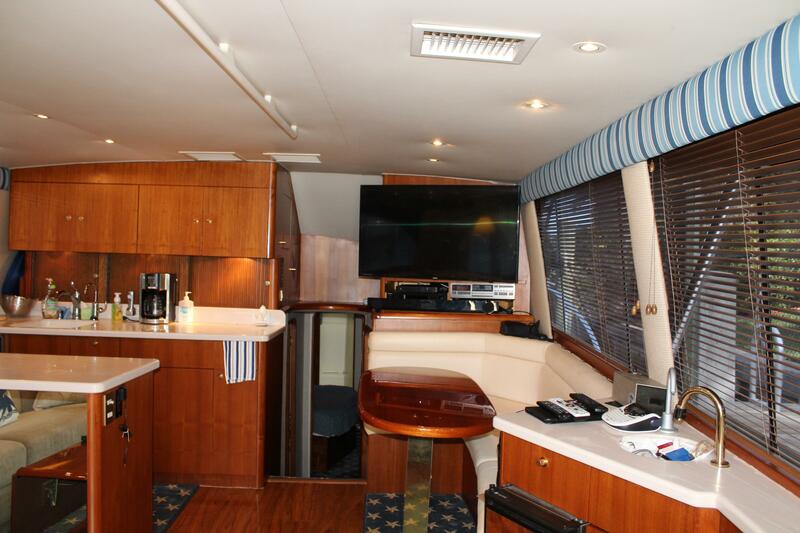 It has Three staterooms and two heads. 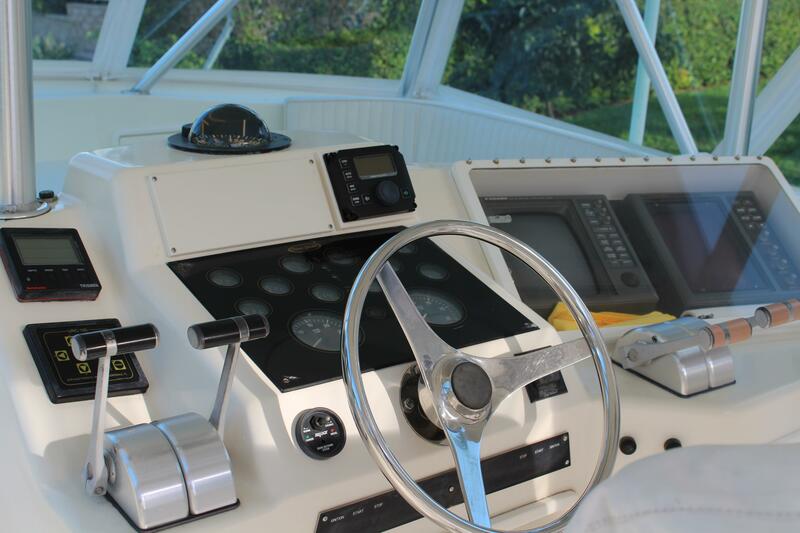 A well appointed helm deck and large cockpit aft .This is a sport fish that brings all the creature comforts of the same class of motor yacht. 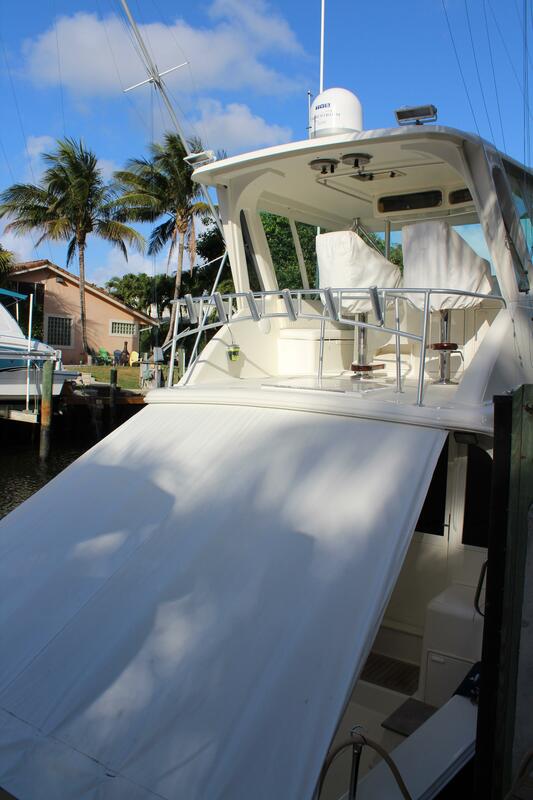 The current experienced owner has gone over the boat and upgraded and modernized the boat.It is ready to take her new owner on a journey of building memories and great adventures. A very good example of a well prepared classic Sport Fish. The boat has had a complete top to bottom paint job in Fighting Lady Yellow hull side and White top side. New soft goods, new three sided enclosure and new salon sole. Wall coverings and lamberkins and head rails. 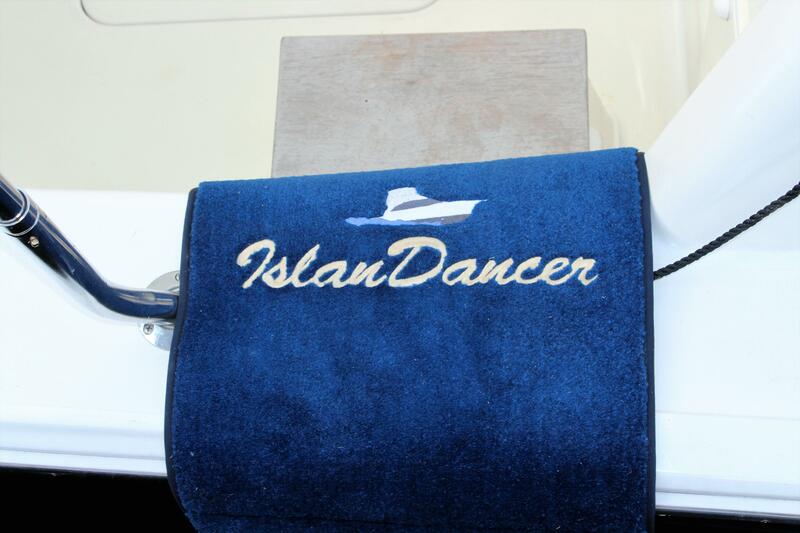 If you are looking for a ready to go, turn key, boat "Island Dancer" is on your short list. 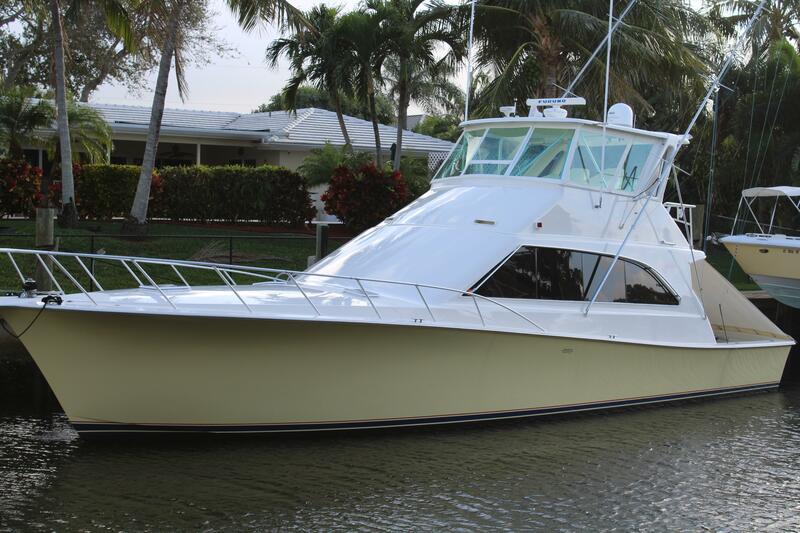 A must see for the serious buyer of a classic sport fish . 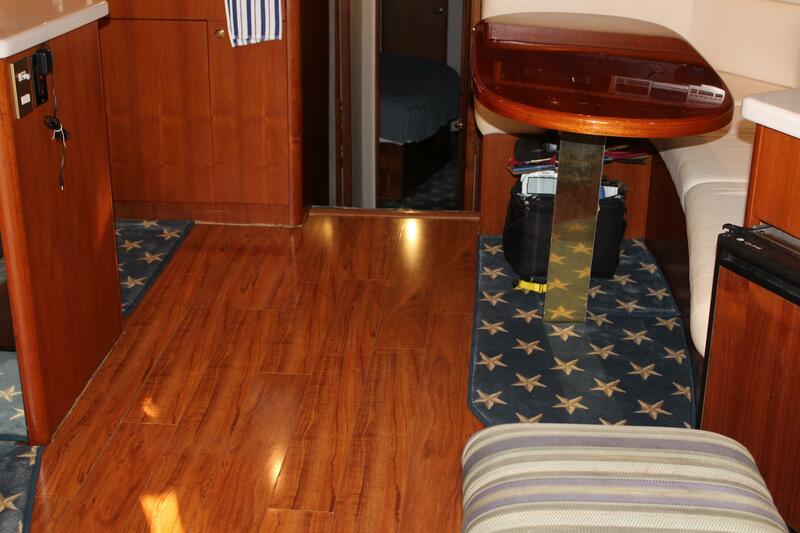 The companionway is center line to the forward Stateroom.the VIP stateroom is port. with a queen bed . The TV is located on built in raised cabinetry. Storage locker . The Guest bunk stateroom is to Starboard. 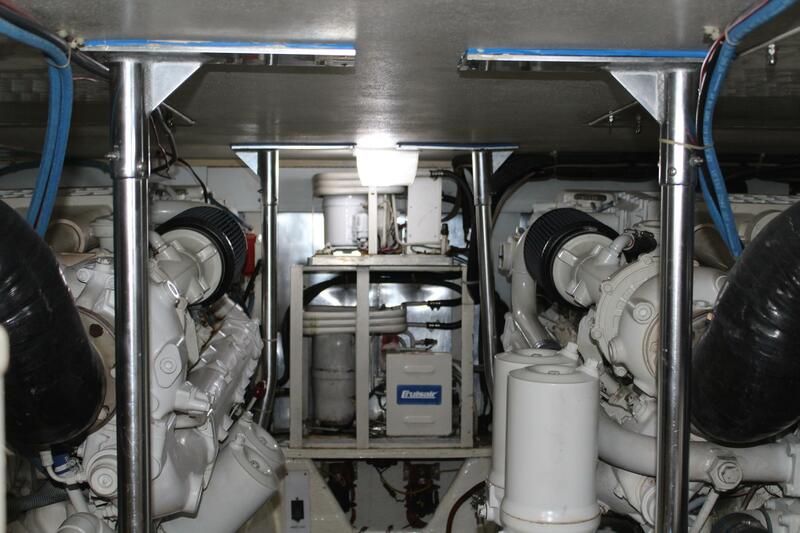 The stacked Frigidaire Washer dryer combination is located in the companionway directly next to the Guest Head , complete with sower Galley Maid Head and lavatory. 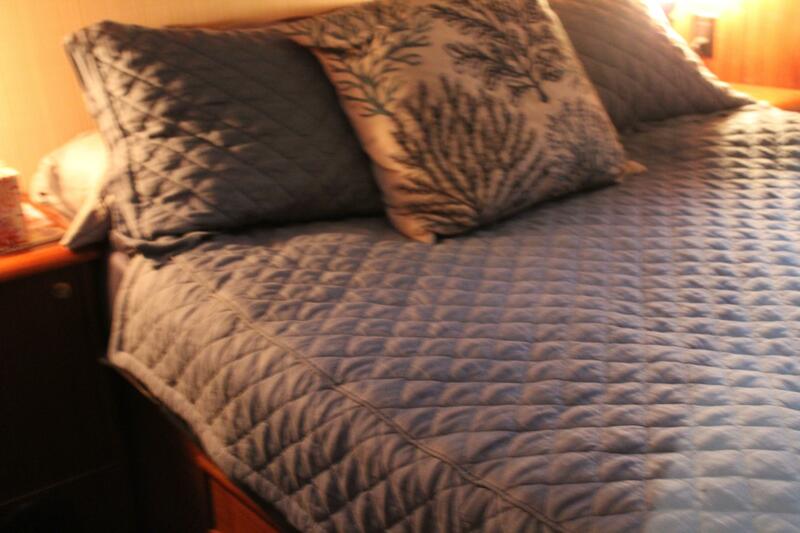 The master stateroom is forward in the bow and features a queen island bed located Awthartship . 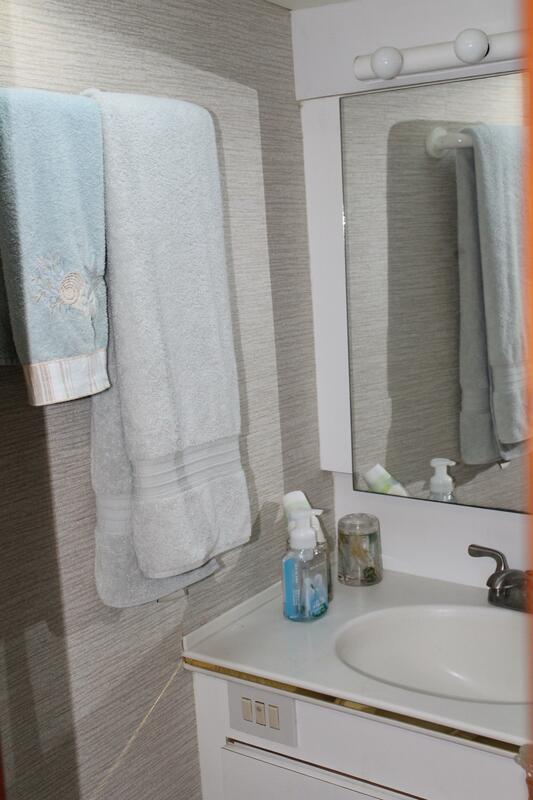 The stateroom has a vanity dressing table and two hanging lockers. a Flat screen TV. The en-suite Head is located in the foremost bow area. and has a great use of space for the shower. 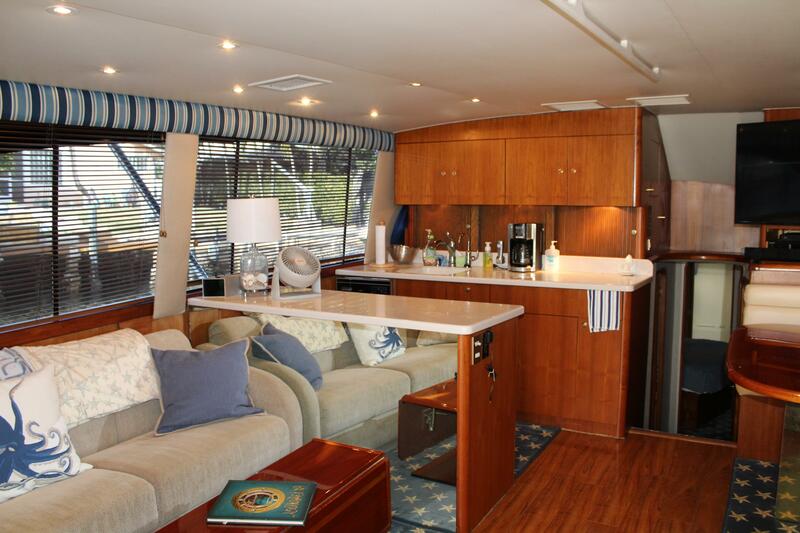 The 53 Ocean is a very comfortable and well planned floor plan . 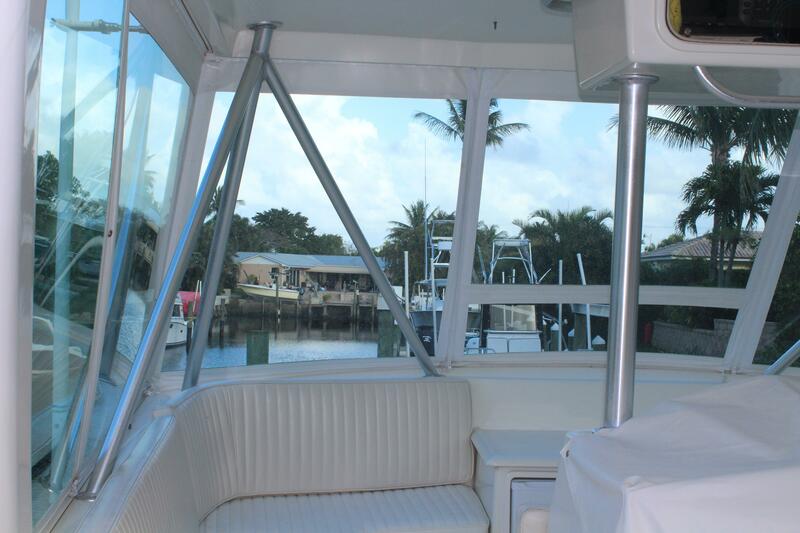 The large aft deck cockpit with a non skid fiberglass sole. 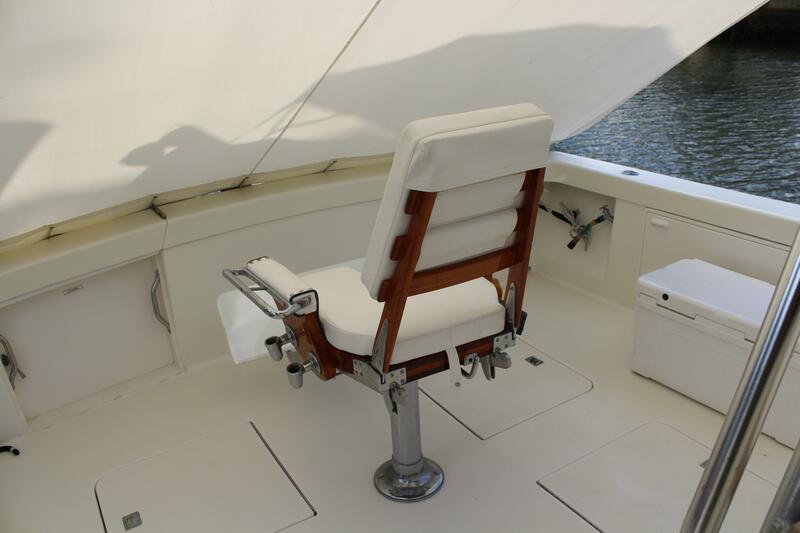 The fighting chair is center line. 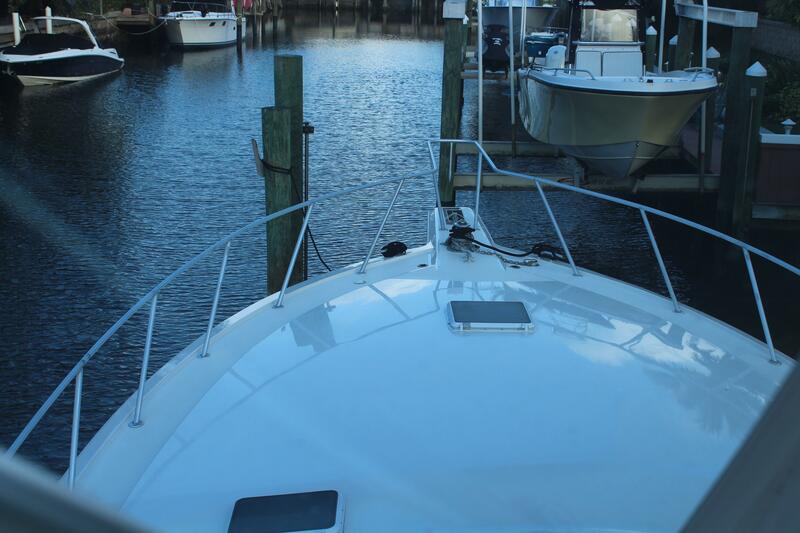 The recessed fish boxes and aft hatches to the Lazzerette. 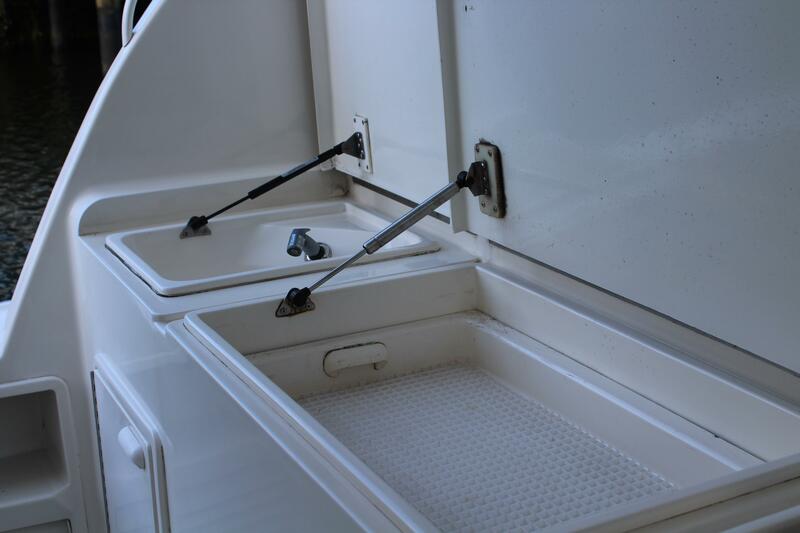 The engine room access is directly underneath the ladder, There is a Freezer and tackle station located in the same bulkhead. The boat has under water lights, and two sets of spreader lights, and a cockpit cover. 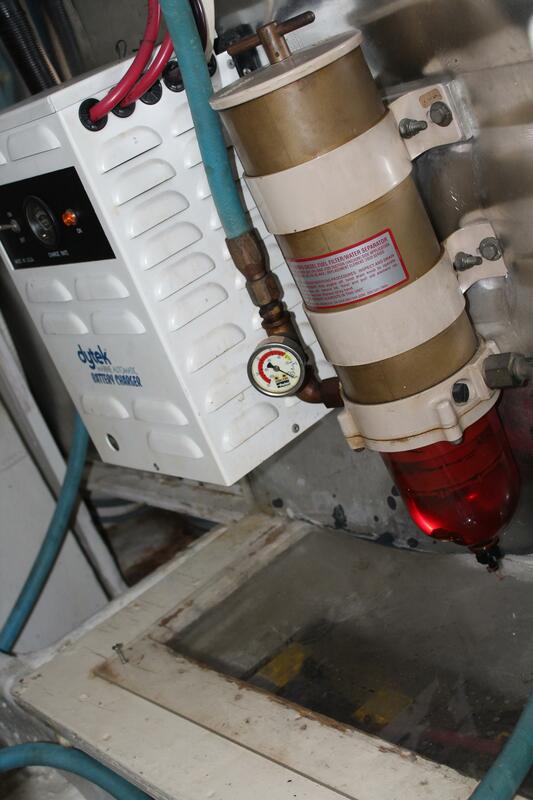 There is a second station of controls in the starboard side locker. 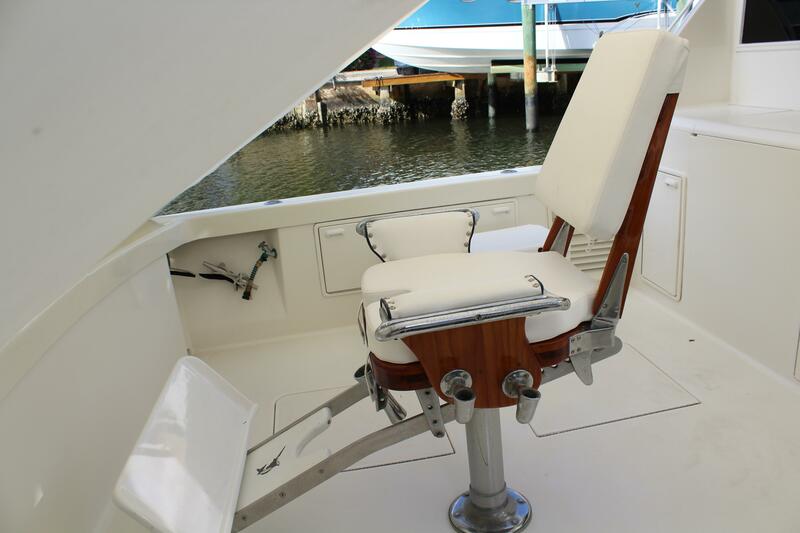 Fighting Chair and 36' Rupp Outriggers with stand offs and lay downs.. Cockpit cover, Fresh and raw water Washdown. Fish boxes and live well. Fiberglass cockpit sole. 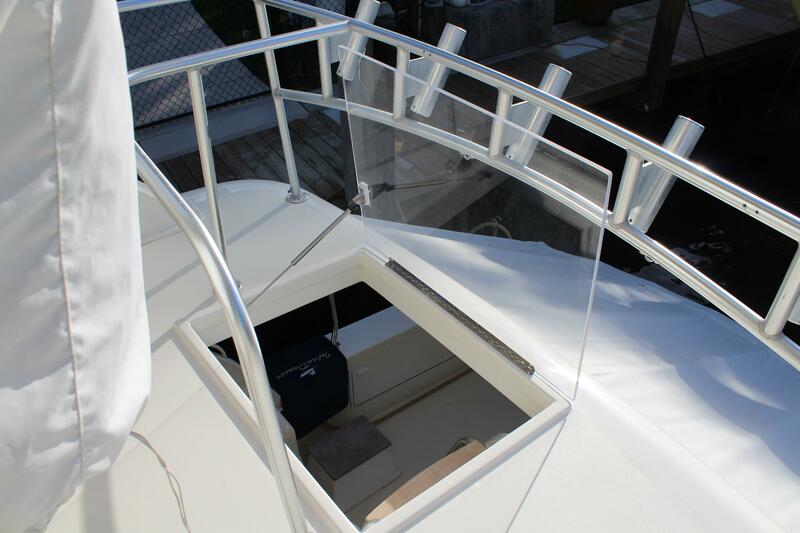 The helm deck is accessed from an awthartship ladder located adjacent to the salon door. 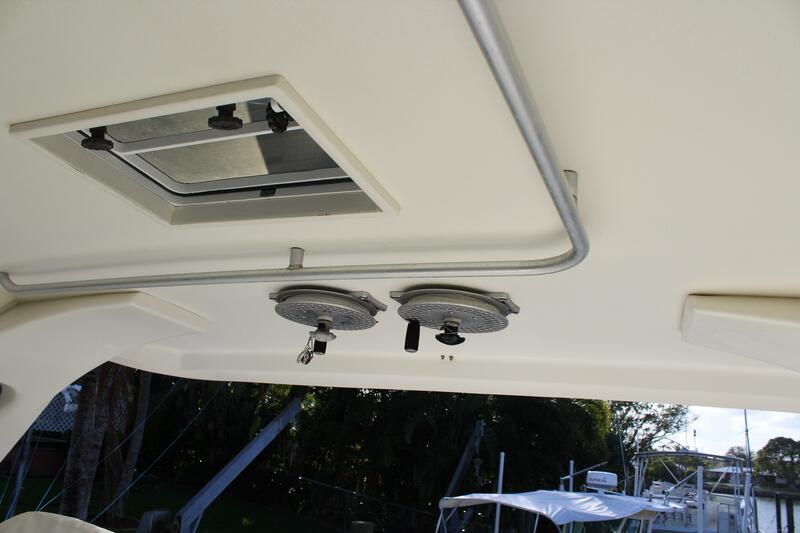 The Lexan hatch door adds a level of safety and sound reduction while under way. 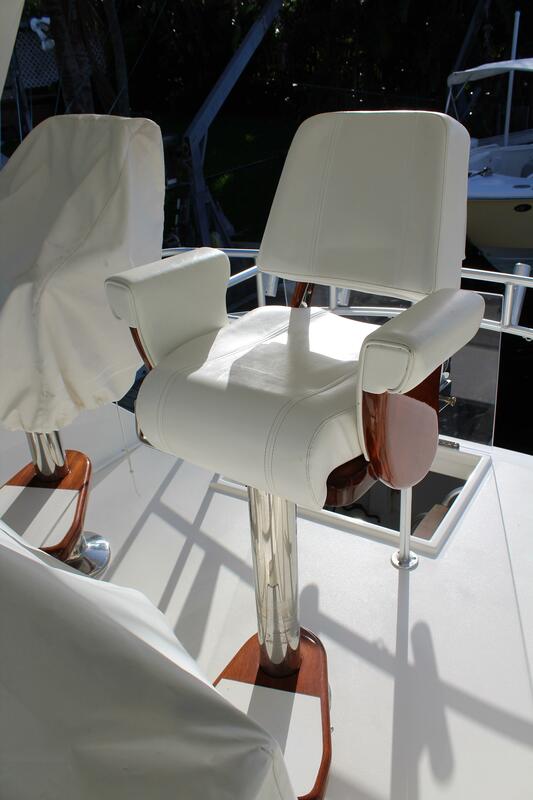 Twin ladder back helm chairs with generous padded seat cushions for the captain and crews comfort . 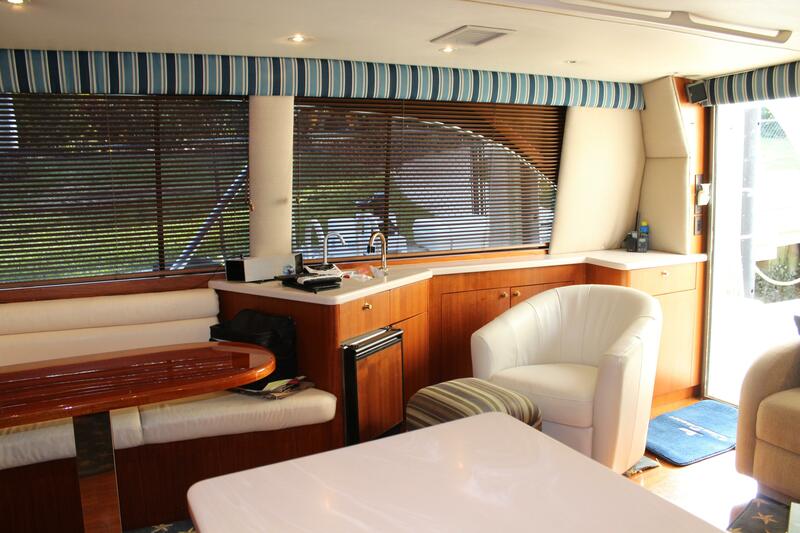 Additional bench seating is port side and forward of the console. Creating plenty of seating for guest. 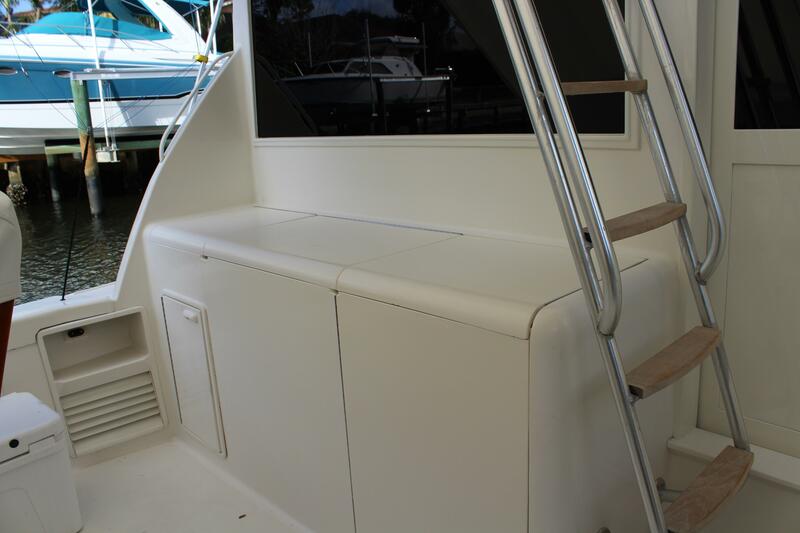 Storage under the settee's and a refrigerator on deck, wrapped in three sided new EZ2CY enclosure,enhances the functional deck. 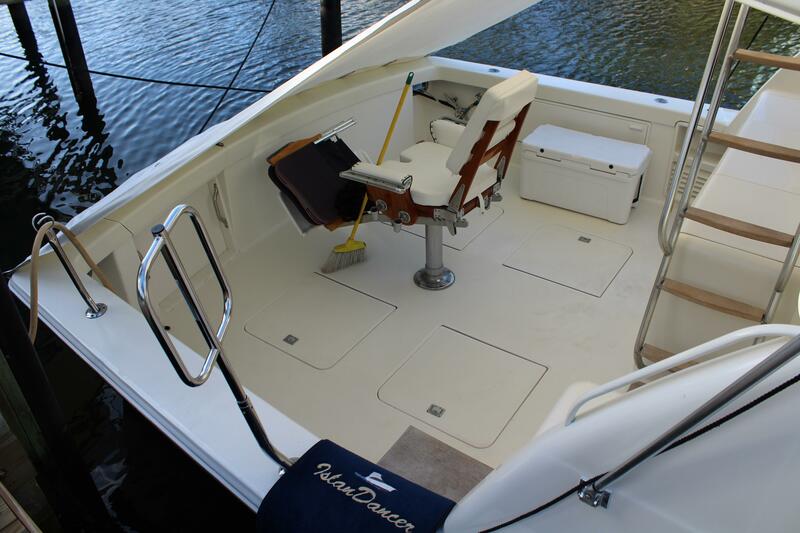 The console is center lined from the starboard side. 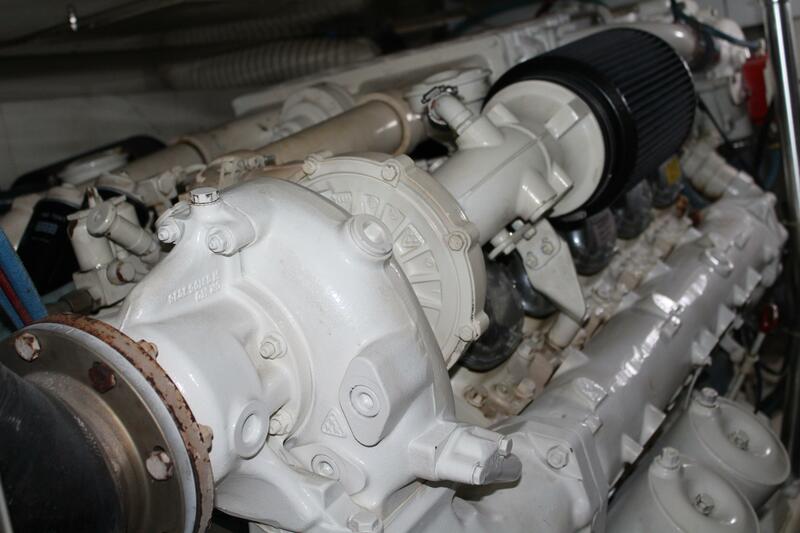 Hydraulic steering . 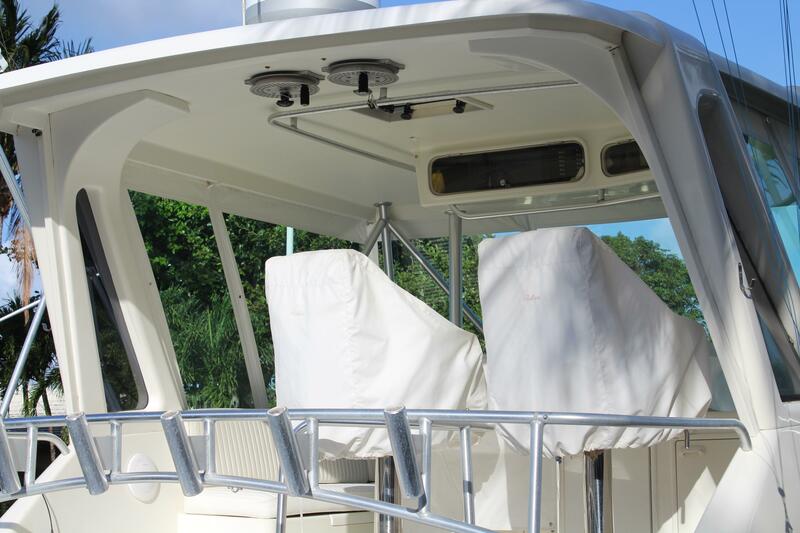 Twin binnacle controls, Engine Gauges, Electronics are all housed in easy sight and reach of the Captain. Teaser reels over head and access to the outriggers, rod holders on the rail aft, and a good sight line to the cockpit . 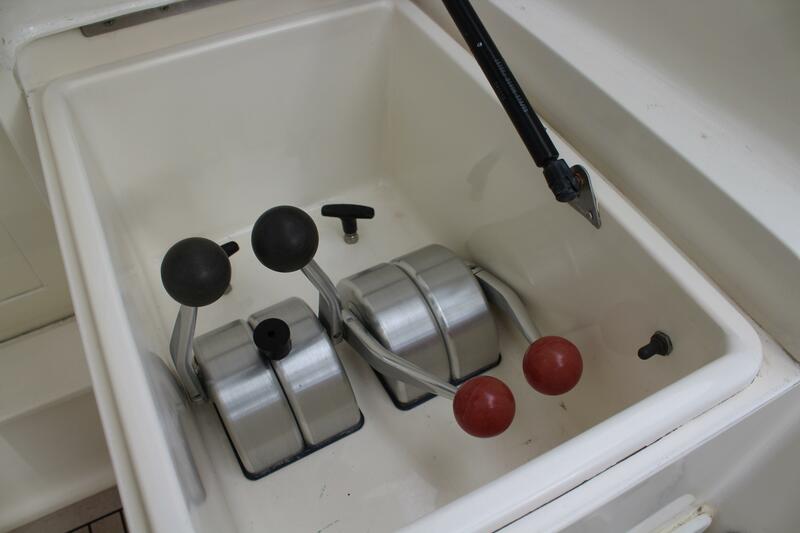 This all adds ups to a serious cruising or fishing machine. 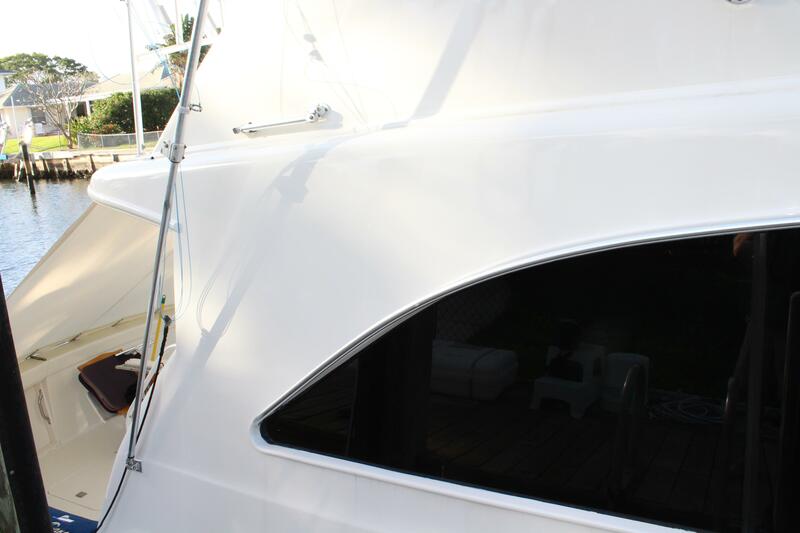 Entry to the Salon is from the Starboard sliding door. The main electrical distribution panel is directly adjacent to the doorway. 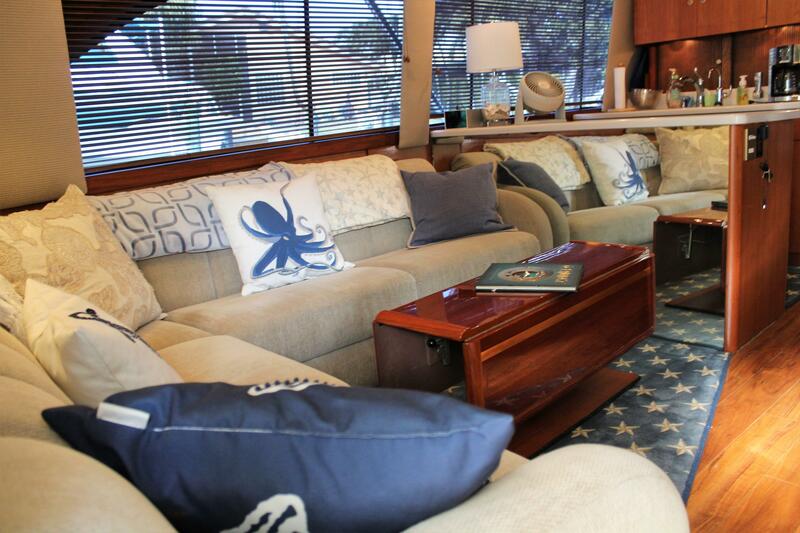 The L shaped settee is port side with under cushion storage. The Hi-LO coffee table can double as additional dining table if needed. The salon sole is wooden flooring. 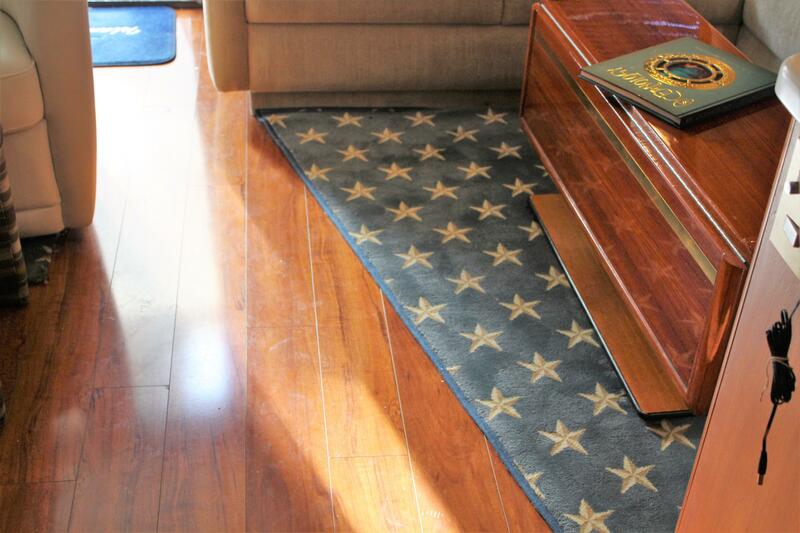 It features area Blue Carpeting with White Stars. 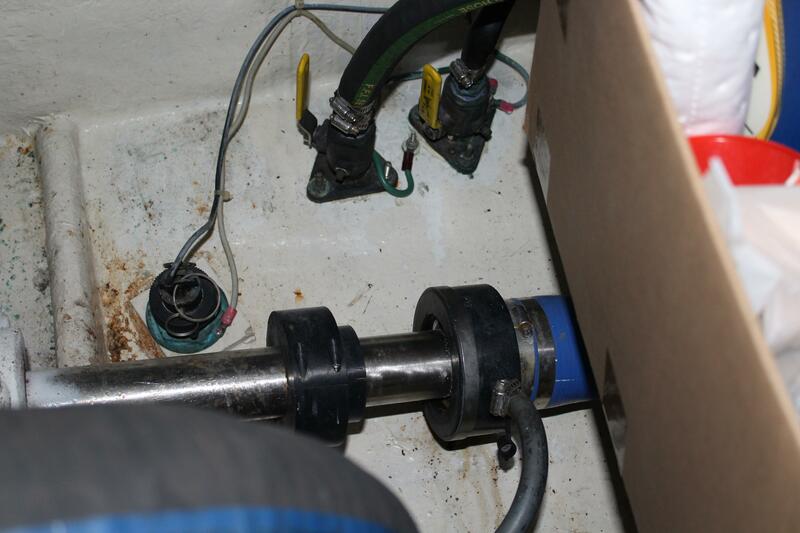 The carpeting is bound on all sides.There is a barrel chair starboard. The window treatments Head rail and Lambekins are new. Privacy is achieved by wooden blinds. Located next to the chair is a U line ice Maker recessed in cabinetry and bar sink and faucet. 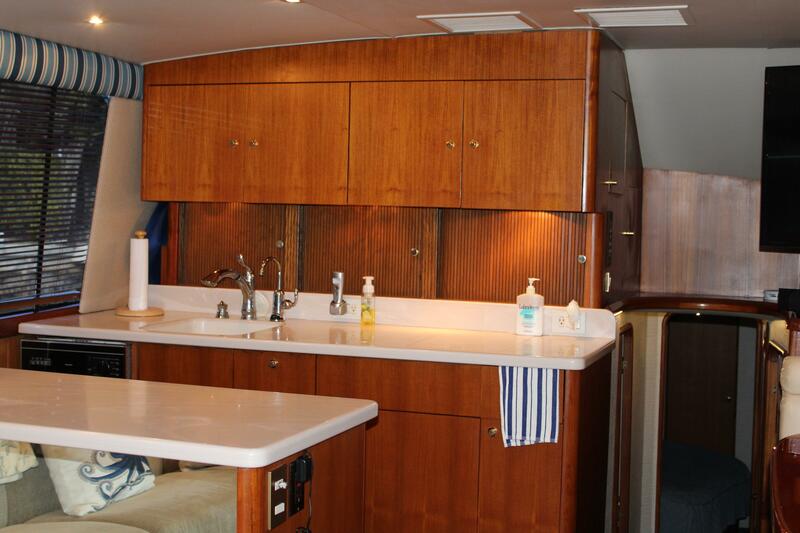 The dinette is on the starboard side directly across from the port side Galley. The Hi gloss table and L shaped seating, additionally the Samsung Flat screen T V is located in the cabinetry, with audio/visual equipment . 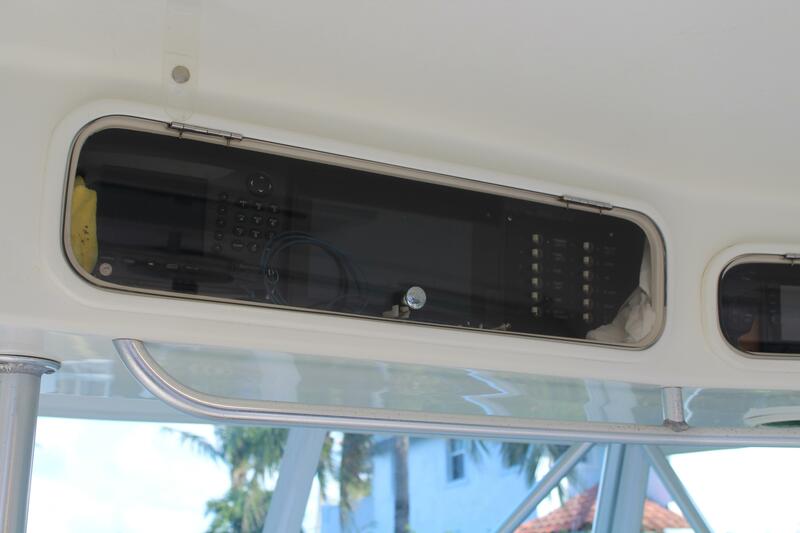 Cruise-air digital control thermostat is located in the companionway. The very functional Galley is framed by an Island counter top with Under counter Sub Zero refrigeration, both freezer and Refrigeration. Coran counter tops and Recessed sink, with Chrome faucets. A recessed princess stove under a removal Coran top.There is also a concealed microwave oven behind a sliding cabinet door.additional storage.